1) Which of the following plants is NOT a member of the cabbage family? The largest wetland in the world is in what country? There are 4 major types of wetlands – name 3! Name one of the 3 states in the U.S. with the greatest wetland acreage. How many gallons of floodwater can 1 acre of wetland store? From 1780-1980 it is estimated that how many acres of wetlands were lost every hour? How many tons of dry matter (i.e. crop or other vegetative residues) do earthworms consume per acre each year? What microorganisms are responsible for soil’s sweet, earthy smell? How many microorganisms can be found in a teaspoon of healthy soil? The human body is home to trillions of microbes that constitute the human microbiome. How many bacterial cells, compared to human cells, are found in the human body? In the human body, the ratio between bacterial to human cells is approximately 3:1. The genes in our microbiome outnumber the genes in our genome by about 100 to 1. The human microbiome: Who’s there? Where are they? What are they doing? The human microbiome mainly consists of bacteria, archaea, fungi and viruses. The surface of the skin, the nasal passage, lungs, digestive and urogenital tracts are all home to microbial communities. The function of the microbiome varies between body-sites and many of its functions are still not well-understood. Some of their functional capabilities include: extraction and storage of nutrients, synthesizing vitamins, training the immune system and protection from toxins. Abnormalities in the microbiome have been linked to a number of chronic and acute diseases, including colon cancer, obesity, diabetes, and infections. Which human microbiome site contains the largest, densest, and most diverse microbial community in the human body: skin, mouth, gut or lungs? Gut (100 billion to one trillion cells per milliliter). Is everyone’s microbiome the same? Does it change over time? When classified by their bacterial species, the microbiome varies a lot between individuals. However, when classified by their functional capabilities or body sites, they are more similar across individuals. The human microbiome changes rapidly between birth and age of two years, during which it gradually acquires a typical adult microbiome. After the adult-like microbiome is established, the microbiome can vary as a result of change in diet, move to a new environment, antibiotic treatments, or a disease state. How does the Madagascar hissing cockroach make its hissing sound? Mexican jumping beans jump because there is actually a small insect inside of them. What kind of insect is it? The longest-loved type of insect in the world is the queen termite. How long can she live for? How many loaves of bread can be produced from one acre of wheat? One acre yields ~40 bushels, one bushel weighs ~60 lbs, and ~42 lbs of flour are milled from one bushel. Therefore, ~1,680 lbs of flour are obtained from one acre. For an average size loaf of bread you need ~1lb of flour, so one acre of wheat yields ~1,680 loaves of bread! Where was wheat domesticated and how long ago did this occur? It was domesticated near the present-day Syria/Jordan/Israel area around 12,000 years ago. Bread wheat is the most common type of wheat worldwide, but what is the other predominant wheat type? Durum wheat (a.k.a. pasta wheat). Rank the following crops in order of “importance” to world food security in terms of number of hectares grown: wheat, corn, soybean. Aegilops – a genus of grasses, including wild wheat relatives. Monarch caterpillars can only eat milkweeds. 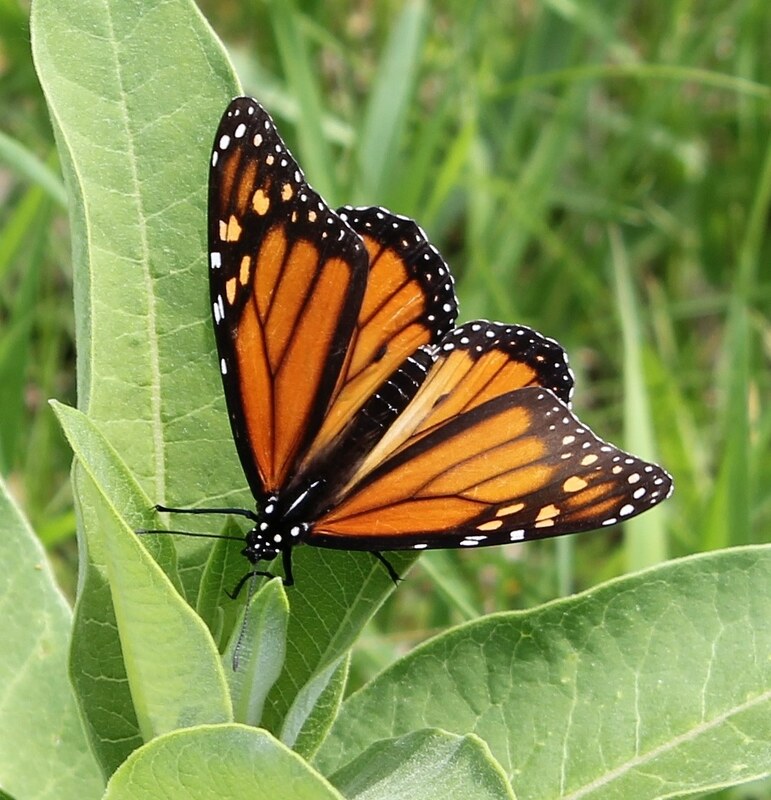 When we lose milkweeds, we lose Monarchs. Plant milkweeds (and other pesticides free native plants!) to help Monarchs and other pollinators! Learn more about how you can help through the Monarch Joint Venture and Plant For Pollinators. Lepidoptera means “scaled (Lepid-) wings (-ptera)”. Butterflies and moths are insects whose wings are covered in scales. The scales overlap on the wings like shingles on a roof. 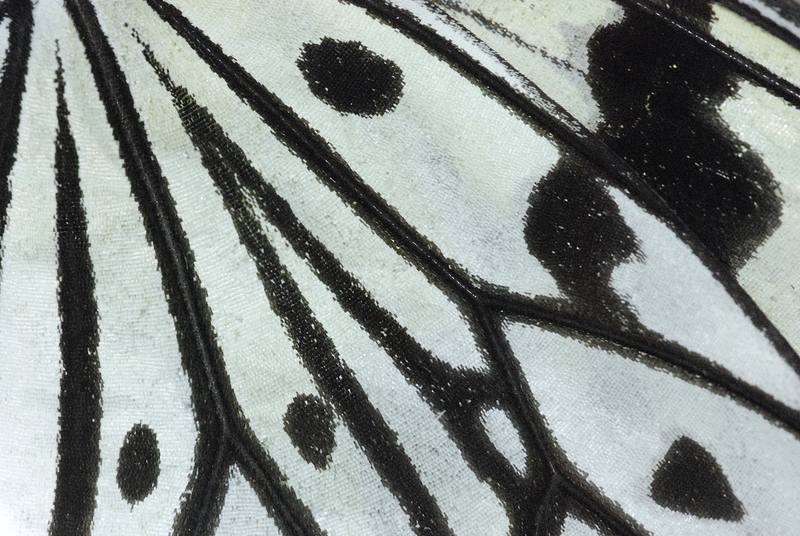 Each scale is a different color, which produces the complex patterns found in the Lepidoptera. What are butterfly tails used for? The back side of the wings of some butterflies have long “tails”. 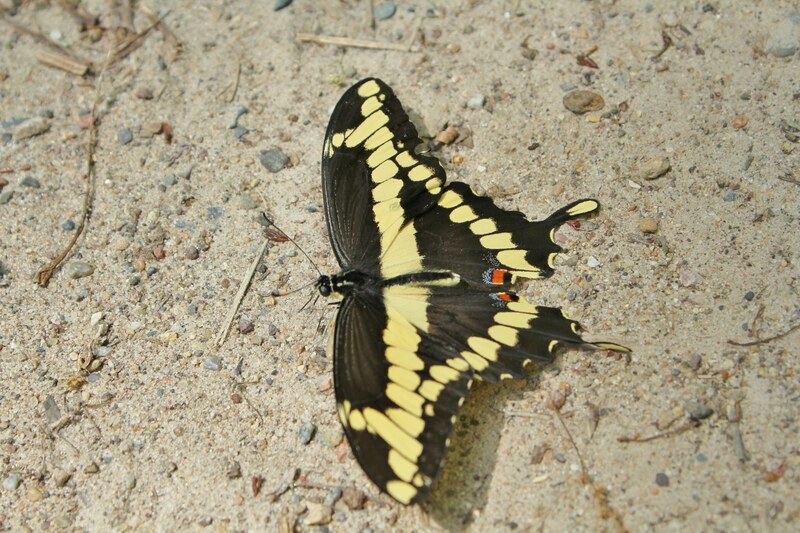 Examples of butterflies with tails are swallowtails and hairstreaks. The tails are thought to be protection from predators. Many tailed butterflies have bright colors or spots near the tails, which make the wings look like a “false head”. A predator may attack the false head, leaving the butterfly to escape with the real head unharmed! Aposematism is “warning coloration”. Many butterflies taste bad because the plants that they ate as caterpillars also taste bad. 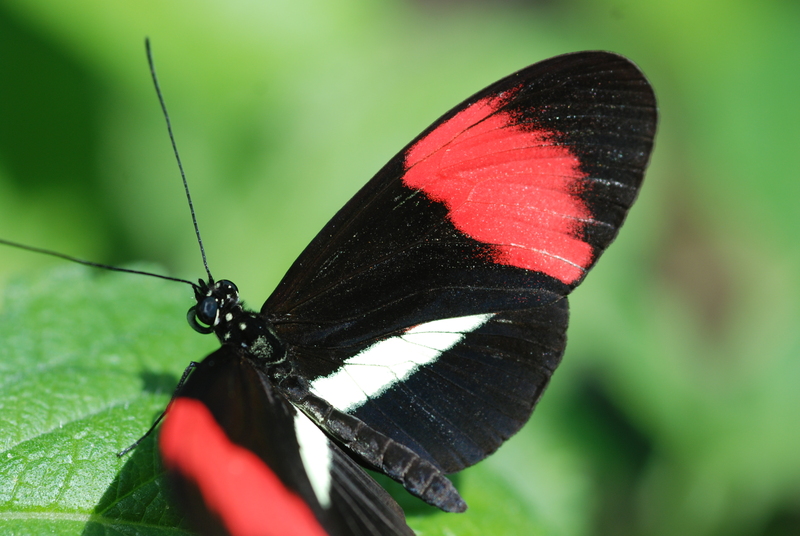 These butterflies “advertise” that they are distasteful with bright colors to warn predators not to eat them. Great examples of aposematic, distasteful butterflies are bright orange Monarchs and Viceroys. What do Red Admiral caterpillars eat? Be careful! Stinging nettle. While adult butterflies often visit many kinds of flowers for nectar, most depend on completely different caterpillar host plants that do not provide resources to the adults. For example, Minnesota’s highly endangered Poweshiek skipperling loves to nectar on Black-eyed Susan, but its caterpillars eat only native prairie grasses. Where do Regal Fritillaries spend the winter? 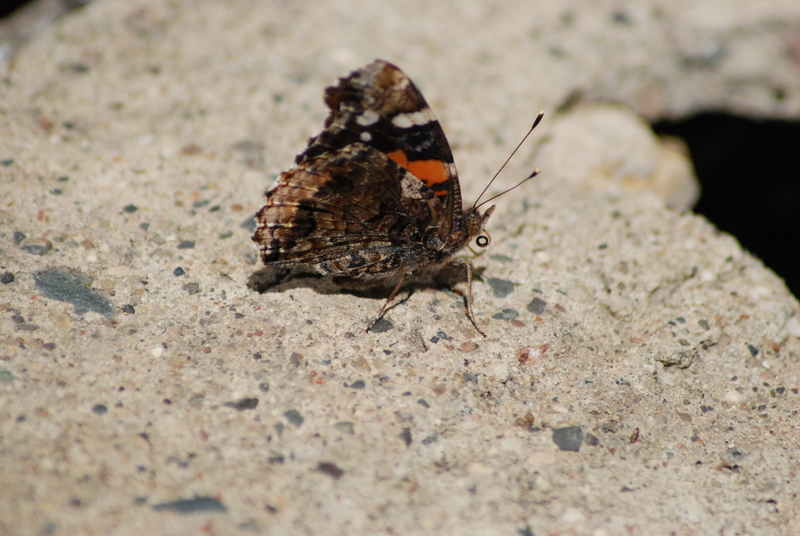 Unlike Monarchs, Painted Ladies, and Red Admirals that migrate south to avoid cold winters, most of Minnesota’s ~146 species of butterflies actually live here year-round! Regal Fritillaries caterpillars hatch from the egg in the Fall, and hibernate as tiny caterpillars under the snow having not eaten a bite! The caterpillars can only eat violets which will not grow until Spring. 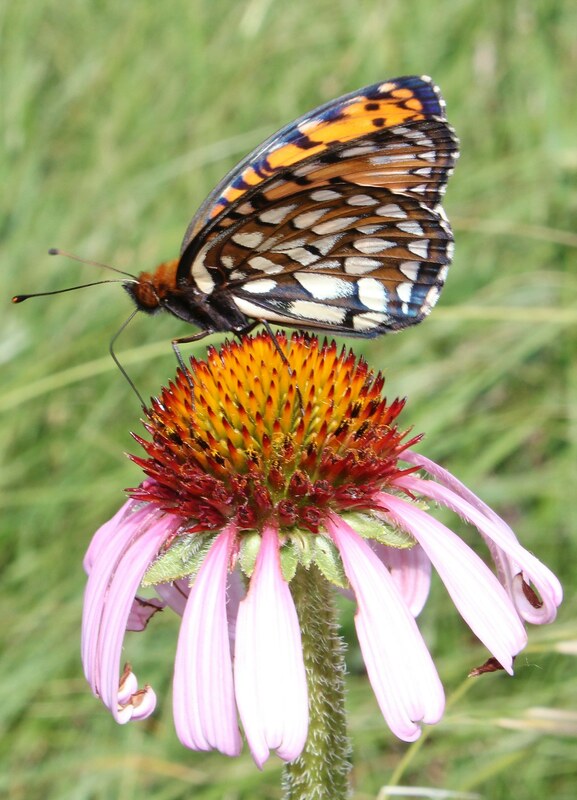 Hardy Minnesotans, Regal Fritillaries are also an icon of our disappearing prairie. What is the name of the especially active area of the Earth’s tectonic plates which produces earthquakes and volcanoes throughout the Pacific? Where is the lowest point on land in North America and how low is it? Fossils such as brachiopods, crinoids, and trilobites found in ancient rocks right here in the Twin Cities suggest that Minnesota was what kind of setting millions of years ago? What percentage of the Earth’s surface is covered by oceans? What percentage of the oxygen in the atmosphere comes from marine organisms? What important ongoing change to the global ocean is sometimes called ‘The Other CO2 problem’? Excess nutrients can cause overgrowth of ______ in rivers, lakes, and oceans. ANSWER: ALGAE. An increase in abundant plant growth, such as algae, depletes oxygen in the water environment and can cause fish die-offs. Excessive nutrient pollution in water systems is known as eutrophication. Which of the following is considered the largest source of nitrogen pollution in water? ANSWER: a. Fertilizers and livestock are the largest sources of nitrogen-based contaminants, like nitrogen oxides and ammonia. Nitrogen pollution contributes to the greenhouse effect and can be detrimental to aquatic life. Bioreactors use the power of microbes (tiny organisms) to produce chemicals and to remove pollutants such as nitrate (a nitrogen-based chemical) from water. Which of the following industries uses this technology the most (per volume basis)? ANSWER: d. In many places around the world, advancing bioreactor technology has been successfully applied to remove a number of pollutants during wastewater treatment processes. A woodchip bioreactor is used to remove nitrate from water. What is the function of woodchips in this process? ANSWER: b. Woodchips serve as home and food for microbes that naturally convert and remove pollutant nitrogen from the environment. Some microbes reduce nitrate to nitrogen (N2) gas. These microbes are called denitrifiers. We benefit from their activity as they clean up water, but what is the benefit to the microbes that complete this process? ANSWER: c. Microbes breathe in nitrate and breath out N2 gas, just like we breathe in oxygen and breathe out carbon dioxide. They can generate energy by this nitrate-respiration. Which of the following most inhibit the activity of nitrate-removing microbes? ANSWER: c. Nitrate-removing microbes grow in environments void of oxygen. These environments are known as anoxic environments. As denitrifying microbes respire, they use nitrate is the base of that chemical reaction (nitrate is used as a terminal electron acceptor). In aerobic, or oxygen-containing environments, oxygen is more energetically favored in respiration. What proportion of the global food supply requires pollination by insects or other animals? About 35%; while many grains are wind-pollinated, a White House report found that of the 115 most popular crops worldwide, 85 require animal pollinators. The Western Honeybee (Apis mellifera) was brought over the Atlantic from its native range in Europe. Genetic evidence suggests that it originated in Africa. How far can pollen be carried by insects? At least 500 miles– researchers in Oklahoma analyzing pollen carried by the corn earworm moth found pollen from citrus and other plant species from at least 500 miles away in Texas. How many nuclei does a pollen cell have? It depends on the species– most plant species produce pollen with two nuclei, while others, such as corn, produce pollen with three nuclei. What makes rhododendron pollen unusual in shape? Most plants produce pollen in batches of four cells, with all four breaking apart from each other to be released into the environment. However, in rhododendrons the four cells do not break apart, resulting in a four-cell cluster being released. Ethnobotany is the study of how humans use plants. This topic is very broad and includes everything from agriculture to medicine to fabrics. Which vegetables that you buy at the market are true vegetables, and which ones are actually fruits in disguise? A fruit is any part of the plant that comes from the flower (specifically the ovary) of the plant. Fruits usually have seeds, and can either be sweet or savory. Examples of fruits include lemons, cantaloupe, tomatoes, avocados, cucumbers, and squash. A vegetable is anything that comes from the non-reproductive part of the plant. So, the leaves, stems and roots of a plant are all vegetables. Examples include carrots, potatoes, spinach, and celery. There are some types of produce that are difficult to classify. Broccoli, for example, is made up of a bunch of flower buds. Flower buds are involved in the reproduction of the plant, but they are not fruits. Can any of plants at the farmer’s market be used as medicine? Most of the plants you’ll see at the farmer’s market are used for food, and not for medicine. However, mints, rosehips, chamomile tea, and willow bark have all been used as medicines in the past, and some of these can be found in farmer’s markets. Which plants, easily found in supermarkets today, were actually domesticated in very different pares of the world (far from Minnesota)? If you had to live on only the foods that were originally domesticated here in the United States, you would have a much more limited diet. Here is what you could eat, broken down by category. Everything else not on this list was actually domesticated outside of the United States. Fruits: tomatoes, pumpkins, squash, pole beans, blueberries, cranberries, and strawberries. How does the study of ethnobotany help in the development of new medicines? Many of our modern medicines were discovered when people began looking at the plants used in traditional folk medicines, and testing each plant separately to see which ones actually worked, and which ones were placebos. Then, people looked for an active ingredient in the plant (the chemical that made the medicine work). Finally, the chemical was extracted and dispensed in its pure form, as a pill. Many indigenous cultures today continue to practice folk medicine, and they have unique plants that are unavailable to people living in industrialized countries. These plants sometimes contain chemical compounds that are more effective at treating certain ailments than any of the chemicals currently known to science. Because of this, many scientists today travel to indigenous cultures and tribes around the world to learn from them and to discover new medicines. The cinchona tree (native to western South America) contains quinine, which is used to treat malaria. The ipecacuanha plant (native to Central America) contains a chemical called emetine, which is used to induce vomiting. Rosy periwinkle (a flower) is native to Madagascar and contains vinca alkaloids. It is used to treat childhood leukemia and Hodgkin’s disease. The mamala tree (a type of rubber tree) is native to Samoa and contains an active chemical called prostratin. It is used to help fight off an HIV infection. How were the first modern medicines discovered? The first active ingredient in a medicinal plant to be discovered, in European culture, was discovered by Dr. William Withering in 1775. He found that extracts from foxglove (a purple flower) helped treat heart conditions like irregular heartbeat and heart failure. He conducted at least 200 studies to confirm this. Later, the active ingredient in foxglove was isolated and given the name digoxin. But be careful with foxglove. Too much can cause heart failure or even cardiac arrest! This process of discovery continues, and will likely continue into the future. For example, in 1972, a new, more effective drug for treating malaria was discovered in China by Tu Youyou. She isolated the active ingredient artemisinin (called qinghaosu in Chinese) from the wormwood plant. The drug extraction was successful in part due to a traditional herbal medicine book written in China in 340 AD. Where in the cell is DNA located? Primarily in the nucleus, but mitochondria and chloroplasts (in plants) also contain genetic information. True or False. Genes are defined as regions of DNA that are the basic unit of heredity. True (for now). The concept of a gene has kept evolving as we learn more about genetics! For example, some viral genomes are made entirely of RNA. How big is the human genome (our complete set of genetic material)? How many genes do humans have? The human genome has an estimated 20,000 – 25,000 genes in 3 billion base pairs. This amount of information would take up 3 gigabytes of space in your computer. What is the genetic distance, or amount of difference, between humans and chimpanzees? Human and chimpanzee genomes as greater than 98% identical. What species has the largest known genome? The amoeba Polychaos dubium may have the largest genome at 670 billion base pairs. It is over 200 times larger than the human genome, showing that genome size does not necessarily imply higher species complexity. What are the four most common GMO products sold in the U.S.? Soybean, corn, cotton, and sugar beets. A DNA-double helix, not to scale. 1.We take core samples from the bottoms of lakes. What are some other types of cores that scientists take? Scientists take cores of many things including: tree rings, ocean bottom, ice cores [glaciers, ice sheets], soil, rock cores . . . and others. The “true” number is not really known. Dr. Myrbo’s advisor did this analysis and says that there are 14,291 lakes larger than 10 acres; other sources say about 12,000. 3. How did the lakes in Minnesota form? Most of the lakes in Minnesota were formed by glaciers! 4. What is the largest lake entirely within Minnesota’s borders? Technically, Red Lake, although that is arguably one lake, since it has Upper and Lower portions. Mille Lacs is the largest single lake. 5. What are the five lakes in the Minneapolis Chain of Lakes? 6. What language does the new name for Lake Calhoun, Mde Maka Ska, come from? The name originates from the Dakota language. 7. What are the main nutrients that can cause problems for lakes when they wash into the lake in excessive amounts? The two main nutrients that cause problems for lakes are Phosphorus [P] and Nitorgen [N], which are both commonly found in fertilizers and other organic run-off. 8. How does street sweeping help Minnesota’s lakes? Street sweeping removes leaves and other organic matter before it can wash into lakes and add nutrients. Further trivia is that street sweeping started in the Twin Cities because of an important U of M study of the Minneapolis Chain of Lakes in the early 1970s! 9. What government agency is in charge of taking care of Minnesota’s lakes? Trick question! The Minnesota Pollution Control Agency, the Department of Natural Resources, the Metropolitan Council, the Minneapolis Parks and Recreation Board, many watershed management districts, many lake associations, the US Environmental Protection Agency, and even more share the responsibility for monitoring and managing Minnesota’s lakes. Yet other agencies and foundations are in charge of providing money for this activity! With over 10,000 lakes, that’s a lot of jobs! 1.What color can bees see that humans cannot? Bees can see ultraviolet, while humans cannot. 2. What color can humans see that bees cannot? Humans can see red, while bees cannot. 3. How many bee species do people manage for crop pollination in the U.S.? 5. Common eastern bumble bees (Bombus impatiens). A few others are managed on smaller scales. 4. What biome tends to have the highest native bee diversity? Surveys of bee species so far tend to find surprisingly high diversity in dry, temperate habitats (ex. the deserts in the southwest U.S. and northern Mexico). 5. Which of the following will bees NOT nest in? Pine cones are unsuitable habitat for nesting bees. 6. How small is the smallest bee in the world? Perdita minima; photo courtesy of discoverlife.org, Jillian Cowles. 7. How big is the biggest bee in the world? About 3.9 cm (about 1.5 in). 1.What are some visible signs of a chemical reactions? 2. The movement of is responsible for all chemical reactions. 3. We (animals) are made mostly of what four elements? 4. What two elements are liquids at room temperature in elemental form? 5. Can you name one common household acid, base, and oxidizer? 6. What are the three most abundant components of air? How much of each? 7. Chemistry is commonly called the because chemistry is fundamentally important to physics, biology, geoscience, ecology, and medicine. Trivia is for the Birds! 1.Colored bright red, the ________ is the most common state bird in the United States. The Northern Cardinal is claimed by seven states as their state bird, beating out Western Meadowlark by just one state. This fact tells an interesting story about the symbiosis between humans and Northern Cardinal. Adapted to forest edges and openings, the cardinal was far less common when the East was covered in continuous forest. But when European colonizers began deforestation of the East, new habitat that cardinals never had access to was suddenly opened up. Now, as suburbs and other developments spread across America at the expense of native forests, so too does the Northern Cardinal. If Eastern forests had never been cut down to the extent that they were, it’s questionable whether Northern Cardinal would ever qualify as a state bird. 2.Most of the bird species that fly south for the winter have a diet composed of ____. Part of the reason so many birds have to migrate south for the winter is that their main food source–insects–can’t handle the cold. By migrating to the tropics for the winter and to the northern reaches of North America in the summer, migratory birds take advantage of where the most insects can be found at a given time. With this in mind, you can guess that any birds you see around Minnesota during the winter don’t feed on insects, or at least don’t in the winter! 3. After of months of wear and tear, birds ____ their feathers, and sometimes take on a different appearance. Over time, birds’ feathers wear down. And as feathers wear down, so too do birds’ colors, camouflage, and aerodynamics. For these reasons, it’s essential for birds to replace them periodically. Birds molt their feathers once, twice, or even three times per year, and can molt different parts of their plumage at different times. Because multiple molts can happen per year, birds often molt into an impressively colorful plumage before the breeding season, and then molt back into a more camouflaged plumage for the non-breeding season (male Scarlet Tanagers are a perfect examples of this). 4. Birds are living proof that the ________ never went entirely extinct. Modern birds are just one branch on the dinosaur tree of life. While most dinosaurs went extinct 65 million years ago, birds live on and flourish. According to taxonomic work on the border between paleontology and ornithology, birds have been shown to be closely related to raptors like the Velociraptor. This lines up with recent research that reveals some surprising facts about dinosaurs, including that many of them had feathers long before they evolved flight, and that many if not all of them were warm-blooded. Killdeer eggs in a barley field! Fungi with a fun guy: feast, famine, and the fungus among us! 1. Plants reproduce using seeds, whereas fungi reproduce via ______________. 2. An apple is to an apple tree as ______________ are to some fungi. Mushrooms or conks – Mushrooms and conks are fruiting bodies produced by some fungi. These sporocarps (meaning ‘spore fruits’) are important for disseminating spores. If you see a mushroom or conk in nature, most of the fungus that is producing it exists in the tree or soil that it is emerging from. Most fungi (think molds) never grow mushrooms or conks, but produce their spores in or on microscopic structures. 3. Of the 1.5-5.1 million fungi that are estimated to exist, we have described approximately how many? 100,000 – This means that mycologists have only described ~2-7% of all fungi. In other words, we (including future mycologists) have a lot more work to do! But why are these fungi so hard to find and describe? Many fungi that exist in nature cannot be grown in laboratory settings. We often only know that certain fungi are present due to relatively recent advances in detection methods that directly test for DNA. Unfortunately, fungi for which a specimen cannot be collected and deposited in a culture collection are not allowed to be considered species. Some mycologists believe that this system is antiquated in light of the rapid progress in molecular biology. 4. Fungi are most closely related to which group of organisms listed below? Animals – Fungi actually share a recent (evolutionarily speaking) common ancestor with animals known as the Opisthokonta. Indeed, one of the primary cell wall constituents of fungi is chitin, the same compound that is found in the exoskeletons of insects and crustaceans. The many similarities that fungi share with humans make fungal-caused diseases especially difficult to treat. 5. Fungi are important because _________________________________. All of the above – This is the obvious answer, but very few people realize how important fungi are in nature or for biotechnological applications. Most people only think about fungi when their food is moldy or they see some mushrooms, but fungi are nearly everywhere playing important roles that often go unnoticed. There are fungal spores in every breath you take. Fungi are on you and in you effecting your immune system. Fungi are in and on every plant around you protecting them from diseases and helping them access nutrients and water. The soil beneath your feet is packed full of fungi. Wood-decaying fungi are critical for forest health, but also cause more than one trillion dollars in damage each year. The same enzymes that fungi use to decay wood can be used to degrade diesel fuel, pesticides, dyes and explosives such as TNT. Fungi have been at the heart of devastating famines. Fungi have even shaped culture (the English used to drink coffee instead of tea). Perhaps most importantly, we would not have beer, wine, fluffy bread, salami, several cheeses, soy sauce or mushrooms without fungi either! Why do trees in Minnesota have rings? Plants move water throughout the plant in a series of pipe-like specialized cells, or xylem. Trees, especially in Minnesota, have identifiable xylem in the stems or trunks. We call these tree rings. Trees form xylem throughout their growing season, from spring to early fall. They also have access to different amounts of water throughout their growing season. In the spring, the soil is wetter with snowmelt and spring rains, while by August, it’s hot and there isn’t as much rain. Because water moves through the plant as it’s sucked out by the atmosphere, plants without much access to water can form bubbles in xylem, which stops water flow (this is somewhat similar to form bubbles in a straw when near the end of a drink). Plants can avoid that by forming smaller (thinner diameter) xylem in dry conditions. Because the trees in Minnesota form xylem of different sizes each growing season (wide in spring and thin in late summer) we can see annual rings. What parts of a tree are alive? Because trees and shrubs are woody plants, there are large parts of a tree that aren’t alive. The leaves of a tree are living, but being woody means that plants form tough carbohydrate structures for water movement (xylem) and support for the xylem each year. The structures form most of the tree trunk and tree roots. Xylem and its supporting woody tissues are not made of live cells, so a large chunk of any tree trunk is not alive. However, just inside the tree bark and outside of the most recent xylem, the phloem cells move sugars from the leaves to the stem and roots: these are living cells. This is why girdling (or stripping away the bark of a tree) can kill it. That is where all of the living plant cells in a tree trunk are. What causes buds to burst on trees in the spring? Buds contain tissue that forms or expands into the first leaves and flowers of spring. They overwinter on the trees. There are several factors that cause the formation: the trees here in Minnesota form buds in response to a shortening day length and longer night length (and sometimes cooler temperatures) which indicates the onset of later autumn and winter. Trees have a method of tracking cold days during the winter and once they have experienced enough cold days, they will then begin to expand buds when temperatures warm. This can be a problem if temperatures warm too early and new leaves experience a frost. Plant buds also sense lengthening days and can leaf-out in response to the longer days of spring. How do trees get water from their roots all the way up to their leaves? Like all living things, plants need water. They use it for photosynthesis (the process of using energy from light to make sugars) and to keep their tissues hydrated. Plants move water throughout the plant in a series of pipe-like specialized cells, or xylem. Xylem tubes, or vessels, are connected to another from the roots, through the stems, and into the leaves. The water moves through the xylem because of the forces driving the Soil-Plant-Air Continuum. For most plants, water in the soil is the source of water and roots absorb this water so that it can fill the xylem. Water moves out of the plant through the leaves. The leaves have small pores, stomata, which open to take on carbon dioxide, CO2, which the plant uses for photosynthesis. The leaves are like small bags of water, while the air outside is much more dry (not 100% humidity). As would happen if a glass of water is left outside on a warm day, water is lost to evaporation. So when the stomata on a plant’s leaves are open, CO2 comes in, while water evaporates out. This loss of water exerts a negative pressure akin to the sucking of liquid through a straw. When the plant loses water in its leaves, it pulls more water from the xylem (in the leaf veins) and that pulls more water from the xylem in the stem, which pulls more water from the xylem in the roots, which can then absorb more water from the soil. Sap is several things in a plant. We call the water and nutrients that move through the xylem sap and we also call the sugary solution that the plants move through phloem (down to the roots) sap. Pines and several other plants have an additional kind of sap: a resin that is very sticky. This resin can fill wounds in the plant and help protect against diseases. Explore tree rings at the Market this week! To test your knowledge of weird plants, try and answer these questions. We talked about some of these amazing plants this week with Daniel Stanton, A University of Minnesota researcher who studies lichens and mosses that live in extreme environments (like the Atacama Desert). What terrestrial organisms can survive in space and on other planets? Bacteria, tardigrades (water bears) and lichens are the usual candidates. Lichens have been sent out into space for 18 months and been completely fine. They could also withstand the pressures created if they were on an asteroid crashing to earth (although they would need some shielding from the heat). A separate set of experiments should that a species of lichen from Antarctica could survive and grow for at least a month on the surface of Mars, where temperatures can swing between -50°C (-58°F) and +23°C (73°F) everyday. Which plant stores the most carbon on Earth? Although trees may hold the most carbon as a type of plant, the single biggest carbon storer is probably Sphagnum moss. The huge peatlands of North America and Russia contain 150 billion tonnes of carbon. Warming and drying of bogs threatens to release a lot of this currently stored carbon into the atmosphere. What is the difference between drought tolerance and dessiccation tolerance? This can be a tricky concept to grasp. Most of us are familiar with drought tolerance (think cacti). Drought tolerant plants are able to stay active during drought by storing water, and being very efficient in their use of water. This can, however, only last so long, if a drought is too extended, the plants water reserves will run out, and the plant will die. Dessiccation-tolerant plants, like most mosses and lichens, have a very different strategy. They can only be active when they have recently been wetted, and often dry out very fast. However, even after they have dried out they are still viable and able to recover after days, months or in some cases even decades of being dry. In flowering plants some seeds have retained this ability, but most adult plants have not. How many uses of Sphagnum can you think of? How do parasitic plants find their “prey”? It is a challenge for a mistletoe or dodder seed to find a suitable plant to grow on! If a bird or mammal drops the seed near a good host, that helps, but the seedling still needs to know in which direction to grow. The seedlings are able to “smell” their way to food by growing towards the source of chemicals released by their prefered plants. Test out your knowledge of viruses with these trivia questions. This Saturday we explored the world of virus biology with Amy Kendig, a University of Minnesota graduate student who researches virus-plant-insect interactions. How many viruses are on Earth? There are more than 1×10³¹ viruses on Earth. That’s more than 10 million times more viruses than the number of stars in the universe. How big is a virus? Most viruses that have been studied are between 20 and 300 nm (nanometers). That means 500 to 5000 viruses must be stacked on top of each other to be the same size as the width of a piece of paper. Recently discovered “giant viruses” can be up to 1500 nm! How many viruses do humans encounter in a day? People inhale thousands of viruses each day and they swallow billions when they swim in the ocean. If a person is sick with the flu, they can have up to 100 trillion viruses in their body. What types of organisms can viruses infect? Viruses can infect any cellular organism – animals, plants, fungi, bacteria, archaea, algae, protozoa, etc. It depends who you ask! Viruses consist of genetic material (DNA, RNA) and a protein capsid, so they have to rely on host cells to make new copies of themselves. Because there is no universally agreed-upon definition of “life”, some people think viruses are alive while others do not. What do you think? What makes something “alive”? What antibiotic was discovered when fungi accidentally contaminated a petri plate of bacteria? When Alexander Fleming accidentally left the cover off of his petri plate of Staphylococcus bacteria over a long weekend, he returned to find that a fungus had contaminated the plate and that wherever it grew, it killed the bacteria. He had discovered the first antibiotic, which he dubbed Penicillin, produced by the fungus Penicillium. How big and how old is the largest fungus in the world? Known as the humongous fungus, an Armillaria in Oregon currently occupies 2,385 acres and is estimated to weigh up to 35,000 tons! This fungal individual may be over 8,000 years old, and is currently the largest living organism on EARTH. What is Minnesota’s state mushroom? Minnesota’s state mushroom is the Morel, although exactly which morel has been the topic of some debate. Several species are known in Minnesota and the number is currently growing! Since scientists have begun using DNA technologies to tell species apart, they’ve discovered that there are a lot more species of Morel than anyone ever suspected. When is a berry not a berry? This isn’t a silly riddle: botanical terms and the terms we use at the grocery store–and in our gardens–are sometimes at odds. To a botanist, a berry is a kind of fruit that is fleshy and has multiple seeds. Blueberries are true berries and so are tomatoes and squash. Raspberries are actually a bunch of small fruits with single seeds (drupes!) stuck together, but aren’t true berries. Strawberries are not true berries either, but a bunch of single-seeded achenes (the golden dots that are the true fruits on the outside of strawberry), with red, fleshy receptacles holding them all together. Do pine trees have fruits? Pine trees have ancestors that are much older than oak trees or apple trees. Pines, and relatives like spruce and juniper, do not flower, but produce pollen and eggs in cone structures. All fruits must develop from the ovary tissue of a flower. Pine seeds do not develop within the ovary of a flower, so they can never develop fruits. They generally produce naked seeds and when the seeds have a fleshy covering (like juniper berries or gingkos) it’s still not a fruit!. So pine nuts aren’t nuts: they’re just seeds and they are still delicious. What’s the difference between a fruit and vegetable? This is a tricky question. When we shop for produce, we often think of fruits as sweet treats and vegetable as savory snacks or ingredients in a dinner dish. However botanists distinguish fruits in a simple way. The fruit, which contains the plant seeds, is from the ovary of the plant. The ovary is part of a plant flower. So many things we think of as vegetables are actually fruits: tomatoes, bell peppers, squash. Botanically, vegetables would be parts of the plant that aren’t reproductive, like carrots (root), potatoes (stem), onions (modified leaves). What are leaves doing all day? Do you eat leaves? Leaves are the energy-production location in most plants. Plants use photosynthesis to take light energy from the sun, water (usually pulled up from the roots), and carbon dioxide from the air to make sugar molecules.The plant uses these sugars all throughout the plant to have energy to make its cells run. Photosynthesis happens in small organelles called chloroplasts within the plant cells. Chloroplasts are full of green pigments, called chlorophyll, and these pigments give leaves their green color. You may eat leaves in many forms: lettuce, kale, and cabbage are edible leaves. Bay leaves used in savory soups are used for their spicy oils. Onions show specialized leaves (a bulb) and the stalks of celery are the stalks, or petioles, of celery leaves. When we eat plants, we get nutrients and different types of sugars, originally produced from photosynthesis. How do plants store away sugars? Plants can store sugars, that they have produced using photosynthesis, in many different organs, or plant parts. Many plants store sugars to aid growth in the spring or as a hedge to help a plant survive when it is difficult to produce new sugars. Potato plants store a complex sugar, starch, inside a modified stem, and these starchy potatoes are the part of the plant we eat. Carrot plants store smaller sugars, glucose and sucrose, in their storage root, the delicious orange carrot. Onion bulbs are fleshy leaves that have some simple sugars in the leaves to help with regrowth. Plants also store starch in seeds to help young plants with their first few days to weeks of growth. Popcorn is the exploded starchy endosperm of a corn seed that would have helped that young corn plant sprout right up. Plants also pack sugars into fruits to entice animals, including us, to eat them. That way we do the work of dispersing the seeds! 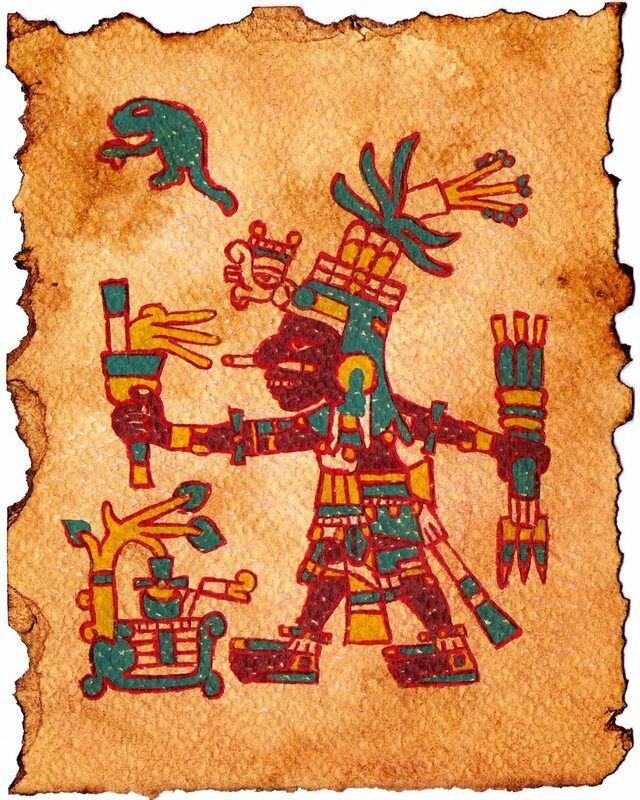 In Aztec mythology, who was the god of maize and subsistence? Which are the top 5 corn producing countries? 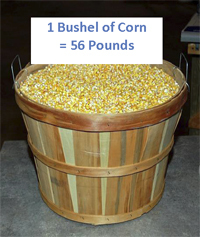 About how much does a bushel of shelled corn weigh? What was the average U.S. corn yield (bushels per acre) in the 1930’s? How about in 2014? In the 1930’s, yield was about 19 bushels per acre. Through the work of corn breeders (many at the University of Minnesota), by 2014 we were up to 171 bushels per acre! How many kernels does a typical ear of corn contain? Around 800 — try counting next time! What is the first plant known to be cultivated by humans? Many sources believe that cereal grains were the first cultivated plants. Wheat and barley were grown in the Fertile Crescent, a region that covered the Nile River Valley of Egypt and parts of the Middle East, around 10,000 years ago. However, new evidence suggests that figs were cultivated in the Jordan Valley 11,400 years ago! What are the similarities and differences between cultivars and landraces (similar, in some ways, to heirlooms)? Cultivars and landraces are both domesticated, which means that negative traits found in wild ancestors, like seed shattering, have been bred out of them. Cultivars are selectively bred over many generations to improve yield and other characteristics, and they are often commercially available and widely grown because of their beneficial characteristics. Landraces, on the other hand, are grown in small regions and become locally adapted to their environment. Landraces are not usually commercially available. Their seed is typically passed down from one generation to the next. Broccoli is a cultivar of a wild mustard plant, Brassica oleraceae. In fact, many common vegetables are from that SAME species. Can you name any of them? What is a hybrid and what are two major advantages of creating hybrids? A hybrid is a cross between two different varieties of the same plant species. One major advantage is heterosis, also known as hybrid vigor. Some crops, like corn, become less healthy when they are inbred, so outbreeding two different varieties typically results in larger, healthier plants with higher yields. A second major advantage of hybridization is that it can be used to introduce new variation into crops. Hybridization is used to improve taste, fruit color, disease resistance, and drought tolerance, among other things. Plant breeders must introduce new variation into cultivated plants to combat disease, drought, salt stress and other constantly changing environmental factors. What are some major sources of new variation? Which two tectonic plates are in contact along California’s San Andreas fault? In addition to its geysers and hot springs, Yellowstone National Park is geologically famous for what feature? What is the name of the huge glacial lake that once covered northwestern Minnesota? What percentage of the Earth’s water is freshwater found at the surface? Name and describe three types of biological interactions. – Competition: when two or more organisms rely on the same environmental resources. It has a negative effect on both. – Parasitism: a symbiotic relationship where one organism benefits and one is harmed. Name one fruit or vegetable and describe at least two ways in which it interacts with other organisms. What types are those interactions? e.g. Beans: We eat them (predation) and thizobia provide nitrogen and plant carbon for rhizobia (mutualism). Most of the time, we get sick because of a microorganism (e.g. virus, bacteria, amoebas) is getting some benefits (mostly resources) from us. What type of interaction would this be and why? This would be a form of parasitism, where one organism benefits (the microorganism) and one is harmed (us). What are ways venomous organisms use venoms to interact with other organisms? 2. Some mammals eat venomous snakes, and have evolved venom resistance to be able to eat venomous snakes as part of their diet! A haemotoxin mainly effect what aspect of the body? What are some things that separate insects from arachnids? Insects have three body parts (head, thorax, abdomen), six legs, antennae, and mandibular mouthparts. Many also have wings. Arachnids have 2 body parts (cephalothorax, abdomen), 8 legs, no antennae, and their mouthparts are called chelicerae. They never have wings, but they do have a pair of appendages (pedipalps) that insects do not have. 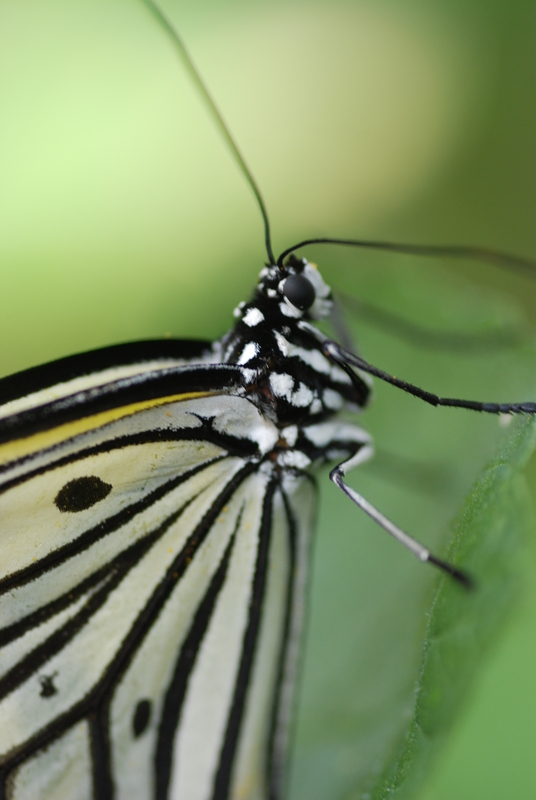 What is the difference between complete and incomplete metamorphosis? “Complete metamorphosis” includes a specialized transitional stage called the pupa. Insects that have this life cycle start life as a larva, which typically looks very different from the adult. Examples include caterpillars/moths, maggots/flies, grubs/beetles, etc. In “incomplete metamorphosis,” there is no pupa stage, and the juveniles (called nymphs) look similar to the adults, though they are not exactly the same. What percentage of spider species are dangerous to people? Fewer than 1%! There are ~45,000 species of spiders in the world, and only a small handful (~20) are considered medically significant. What is the largest type of insect in the world? It depends on how you measure it! The heaviest insect is the larva of the goliath beetle, which can weigh over 4 ounces! The longest is a stick insect, Chan’s megastick, which is over 22 inches long! The largest wingspan (at almost 12 inches) belongs to the white witch moth. Prehistoric insects were even larger than their modern-day descendants– the largest were ancient relatives of the dragonfly, which could be several feet long, with wingspans of almost 30 inches! How many species of insects are there in the world? Scientists have described over 900,000 species of insects so far, but there may be many millions of other species out there that we haven’t found yet! Some scientists think that there could be 2 million species, but others think that there could be up to 30 million! How do insects (like moths) communicate with each other? Although some insects use sounds (like crickets) and visual displays (like fireflies), most insects rely on chemicals to communicate. Chemicals that are used by different members of the same species are called pheromones, and it is by sniffing out these pheromones that moths can find their mates. What percent of the earth’s water is salty? Approximately 97% of the earth’s water is salty. How many gallons of water does the average person consume in a day? The average person consumes about 50 gallons of water in one day. Is it possible for me to drink the same water as the dinosaurs? Yes. The earth has the same amount of water today as when it was formed. It has been recycled through the ecosystem many times since even before the dinosaurs. So, the water molecules coming out of your faucet could be the same ones that the dinosaurs drank. 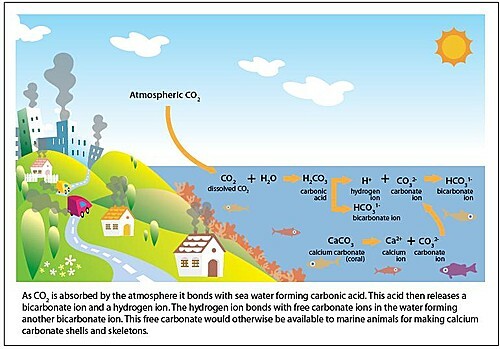 Ocean Acidification is the process by which the pH of the ocean is getting lower, or more acidic. The oceans help to absorb some of the extra carbon dioxide (CO2) that has been released into the atmosphere. About 30% of the extra CO2 is absorbed into the ocean. When CO2 dissolves into the ocean it reacts with the water to make carbonic acid. The increase in carbonic acid in the oceans changes the pH (lowers it) to be more acidic. What ocean animals have a hard time with ocean acidification? The increase in acid in the oceans interferes with the formation of calcium carbonate shells that shellfish (oysters, clams, mussels, etc. ), snails, and corals. This is because the carbonic acid reacts to create hydrogen atoms and bicarbonate in the water. The extra hydrogen atoms react with carbonate in the water. The carbonate is needed to make shells and if it reacts with the hydrogen, the carbonate is not available to make a shell. 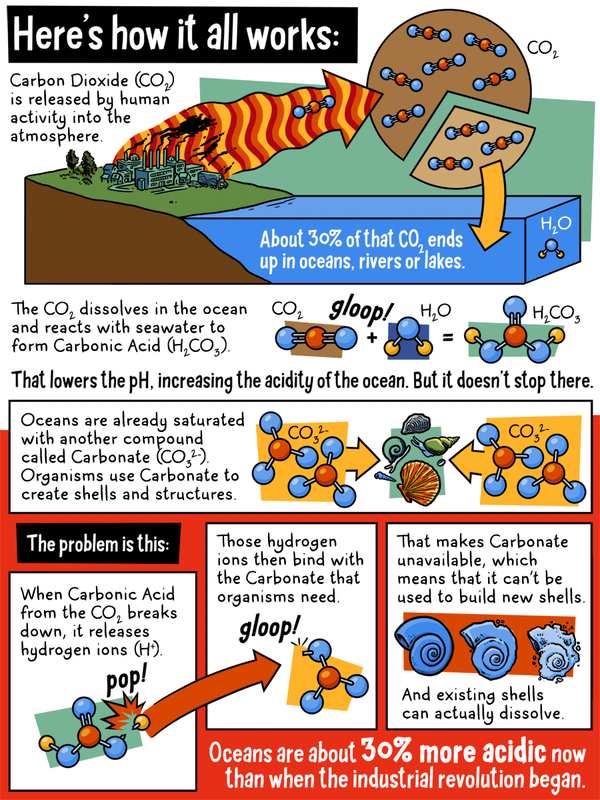 Are all parts of the ocean affected the same by ocean acidification? Coastal waters are especially impacted by ocean acidification. This is because these are areas that are subject to natural upwellings from colder, lower pH waters onto the continental shelves. Areas such as the west coast of North America are subject to these types of upwellings. At the poles, lower water temperatures allow seawater to absorb more CO2. How do prairies survive brushfires? The animals and plants that make up a prairie community don’t just survive fire. They need it to survive! When a fire, whether one set by lightning or people, moves through a prairie, it burns up dead and living plants and kills anything that can’t run away or hide underground. But many prairie plants and animals can escape the fire. Grasses and other “perennials” (plants that survive through the winter every year) have their roots and stems underground, so they can resprout after the fire. Animals that hid in burrows or escaped the fire quickly return. Hot fires burn up trees and bushes that might turn the prairie into a forest and the ashes produced by fires fertilize the newly resprouted plants. How is a prairie different than a grassy park or a corn field? Native prairies are incredibly diverse, meaning that a wide variety of plants, animals, and microorganisms make their homes together. A single acre of prairie might contain many dozens of plant species, instead of just the few that make up an acre of lawn or park. 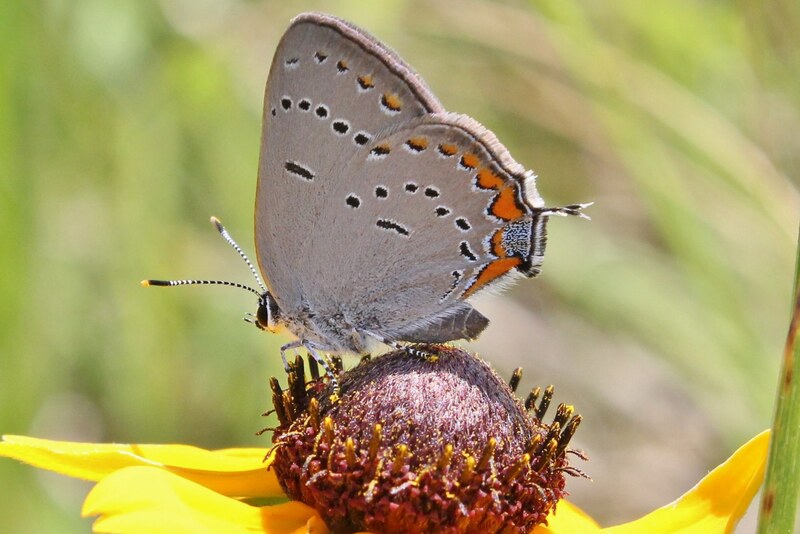 In order to feed on these diverse plants, many “herbivores,” or animals that eat plants, such as bison and butterflies, make their homes in prairies. Prairies are also different than parks and farm fields in that they can tolerate fires, droughts, and freezing weather without requiring replanting by human beings. Are there any native prairies left in Minnesota? Yes, but not many. Before European settlers came to Minnesota, there were 18 million acres of prairie in the state. Now, only 1.3% of that area remains. Settlers and their descendants turned the prairie into farm fields, pasture, and towns. They also prevented fires, removed bison, and disrupted pollination. As a result, native prairies can’t regenerate quite as easily. You can see native prairies at Blue Mounds, Glacial Lakes, or Buffalo River State Parks. Prairies are grasslands – ecosystems dominated by grasses and other “herbaceous,” (not woody) species. “Prairie” comes from a French word meaning meadow. Are there prairies anywhere else in the world? Prairies are a type of grasslands, and grasslands can be found on every continent except Antarctica. The Twin Cities are located on the edge of the North American Great Plains. The South American Pampas cover 300,000 square miles in Argentina, Uruguay, and Brazil. The African Savannahs and Asian and European Steppes are also iconic grassland biomes. Finally, covering an area larger than California, Colorado, and New Mexico combined, Australia’s grasslands blanket the northern and eastern edges of the continent. Are all parts of the prairies alike? Prairie lands cover a broad swath of the central U.S., including areas that are wet and dry, hot and cold. The relatively wet Tallgrass prairies of Minnesota, Iowa, and Missouri are different than the drier Shortgrass prairies that extend all the way into Montana, Wyoming, Colorado, and New Mexico. Prairies can have trees in them (“savannahs”) or can be wet, producing “prairie pothole” wetlands. Why do Mentos cause Diet Coke to explode out of the bottle? The surface of the Mentos provide a lot of nucleation sites — spots where the CO2 can come out of solution. When put in diet coke, the bubbles all form at once, which increases the volume of the liquid/bubble mixture in the bottle, as the CO2 in the bubbles take up more space as a gas than when it was in solution. This builds up pressure in the bottle and the mixture has nowhere else to go except out the open top, creating the really cool fountain that you see. Read more about it here. What is the pigment called that lets you use red cabbage as a pH indicator? Anthocyanin are a pigment found in plants that serves various purposes. Plants use anthocyanins to color flowers and fruits to attract animals. It is also thought to acts as a type of natural “sunscreen” for plant tissues because it can help protect against harmful damage from high intensity light like UV. It is anthocyanins that make the red color you see in fall foliage. The color that anthocyanins reflect are also sensitive to pH. When it is exposed to acid, anthocyanins are pink. When in the presence of basic solutions, they are greenish yellow. What makes food taste sour? Taste is generated by the interaction between your taste buds, which are special chemical receptors, and the chemical properties of the things that you eat. When you eat something acidic the change in the proton ions and anions (negatively charged ions) that are in solution react with your taste buds to generate the a sour taste. Scientists still do not fully understand how this works and are making new and exciting discoveries about how we can sense all of the wonderful things that we eat. Scientists are also still working on how our sense of smell and taste interact to generate all of the flavors that we can taste. This is an open area of active research! Why do bases feel slippery? The base is turning the oils in your skin into soap! This process is called saponification. In saponification, the base is added to a fat, generally a vegetable oil or animal fat. Once added, the free -OH ion causes a chemical reaction that breaks the fat into a fatty acid salt (which is eventually purified and made into soap) and glycerol (a slippery substance that is used for thickening or sweetening foods or as a lubricant). You are feeling these slippery products on your skin, soap and glycerol, when you touch bases. What is the acid present in stomach acid? The acid found in your stomach is Hydrochloric Acid (HCl). Your stomach makes acid to start to unravel the proteins in the food that you eat and start the activity of digestive enzymes that will break the proteins apart so that your body can use them. The acid may also help to kill some harmful microorganisms that get into your body with your food to help prevent infection. The pH of your stomach is generally between 1.5 and 3.5. What’s more dense: a pound of lead or a pound of feathers? A pound of lead is more dense. Density is a measure of mass (how much matter or stuff is present) divided by volume (the amount of space taken up). A pound of feathers would occupy a lot more space (greater volume) than packing all of the lead atoms together (less volume). With the same mass (1 pound of stuff), when we divide by a smaller number, the answer (i.e. the density) will be greater for lead than when we divide by the larger number for the feathers. To describe the acidity of solutions, the pH scale is used. What does ‘pH’ stand for? The exact definition is disputed, but pH is generally thought to stand for “power of hydrogen”. This refers to the fact that pH is on a logarithmic scale. Numbers in a logarithmic scale indicate how many times you multiply 10 together. In fact, pH is a negative logarithmic scale of hydrogen atom activity in a solution. Bees collect nectar from flowers and then bring it back to the hive. They then mix it with special enzymes. These enzymes break down the complex sugars in the nectar into simple sugars. The bees then store the honey in the cells of the honeycomb in the hive. They then let it dry to become thickened and when it is ready they cap the cell to store the honey to use for food later. How many pounds of honey do Minnesota Beekeepers make each year? Minnesota beekeepers make approximately 8,375,000 pounds of honey each year. Beekeepers in the US make 142,296,000 pounds of honey each year. How many species of bee live in Minnesota? Check out http://www.beelab.umn.edu for more information! Bees collect pollen from flowers as a source of protein to feed the developing young. The pack it into cells in the hive. In its pellet form it is sometimes called “bee bread” and used as a nutritional supplement. What differentiates wasps and bees? Bees and wasps are sometimes mistaken for one another. This is a common misconception and makes sense because they are closely related. They come from the same order “Hymenoptera” along with ants and sawflies. The scientific way to distinguish wasps and bees is by looking at them under a microscope. All bees have at least some special branched hairs on their bodies, whereas wasps do not. Even though we can not pull out a microscope every time we want to determine if the insect that we are looking at is a bee or a wasp, there are some other common ways to tell them apart. 3) Wasps tend to have longer legs. Bees communicate it many different ways. One of the most amazing ways that honey bees communicate is through dance. 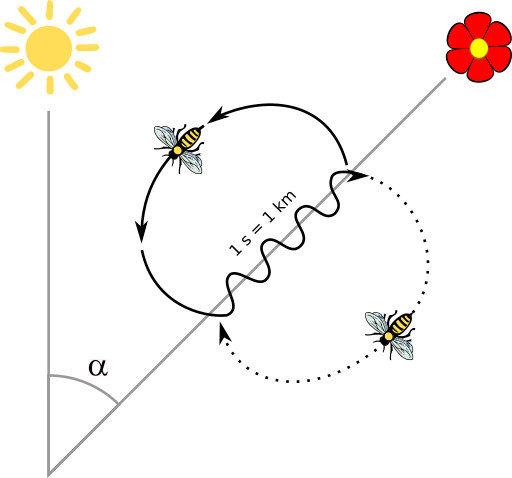 Bees that have found a particularly great patch of flowers can tell their hive using the “waggle dance”. When the bee returns, she will begin to make circles to tell the other bees that she has found a good place to find flowers. Then she will start the waggle dance. She will orient to the sun to tell the other bees the direction of the flowers. Then she will begin to waggle. The number of waggles that she does tell the other bees how far away the new flowers are and how fast she does the waggle tells the other bees how good the new patch is. The faster she dances the better the patch. Bees also communicate using chemicals called pheromones. Honey bees will gather pheromones from the queen in order to know the state of the hive. Check back for new questions and answers to Market Science Trivia!